Is there a market for services whose mission is to help aggregate social conversations? Jordan Kretchmer seems to think so, as long as you’re ahead of the game. Following news of social storytelling platform Storify’s acquisition by Kretchmer’s company Livefyre, we decided to see what the future of social curation is. There are several companies focused on this specific type of service, including Livefyre, with some following Storify‘s route of appealing to journalists and news organizations. But can this target audience scale? The answer is most likely yes, seeing that people are looking to find ways to aggregate topical conversations much faster without them actually needing to put boots on the ground. If there’s any proof of seeing curation’s importance, one could look at Facebook’s TV-related announcement today where it revealed two new API tools to help the media better utilize user data in their broadcasts. But Kretchmer says that it’s not about social curation, but storytelling. It’s one thing to be providing a single perspective, but for many people who want to get the whole picture about what’s taking place, pulling information from witnesses and other sources will truly help someone understand the scenario. For Livefyre, it started off with comments, but sensing that it couldn’t scale big enough (although it seems to be working for Disqus), Kretchmer shifted his company’s strategy to focus on real-time conversations, competing with the likes of Echo and Chute. Since that shift, Livefyre has seen the number of monthly page views increase — in April, the company revealed that it was serving 1 billion monthly page views, an increase of 468 percent year over year. In the end, Kretchmer tells us that he hopes his company will become the social control center for brands, in that they can find all the tools and resources to manage all of their conversations, both from a proactive to reactive approach. Not only is Livefyre able to track people’s thoughts about a particular post or story through comments and social media posts, but also take those same conversations and incorporate them into advertising. The company launched a native ad platform last month that turns Vines, tweets, and Instagram photos into promotional content. But how can Livefyre overcome challengers from the likes of Echo, IntenseDebate, Mass Relevance, and Chute? Kretchmer doesn’t seem to be too worried and said that it’s all about building its own technology, including server architecture and software, to support the needs of its customers — a marked difference from Echo, which he says relies on third-party developers to build apps. 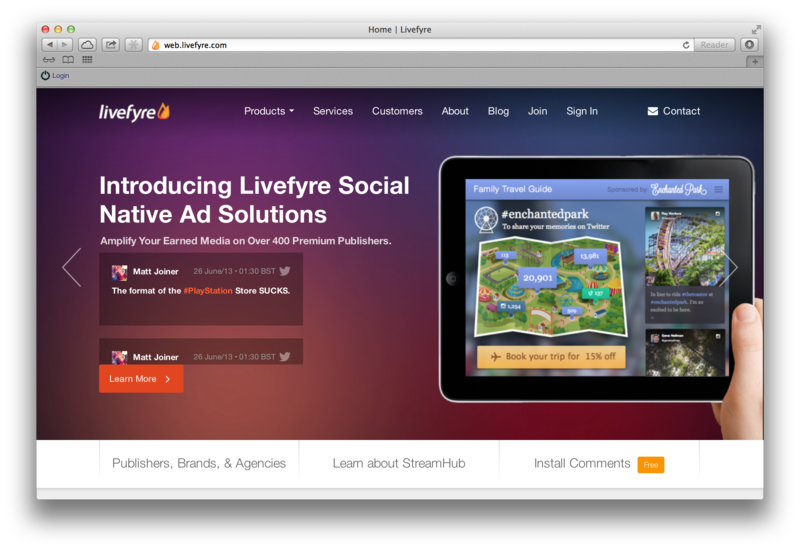 Additionally, Livefyre thinks of itself as just something more than just a photo wall, which he claims that Chute offers. Tough words for its competitors, for sure. And they’re taking issue at it. For one, Chute says that it’s not a photo wall — it’s focused on being a “visual brand engagement platform” powering billboards to banner ads to native mobile apps and using media to help engage brands. In December, the company unveiled an app with Echo (what a twist!) that pulls real-time conversations and photos into a tool for brands. Chute also has launched its own ad platform to use user-generated photos and videos for advertising. With the acquisition of Storify, Livefyre aims to keep itself ahead of the trend so that it becomes a pioneer in the conversation space. What’s next for the company remains unclear, but more acquisitions are planned. Calling itself a Big Data company, it plans on utilizing the massive amount of data it has to help build out new products it thinks its 450 customer companies will want to use. Kretchmer is hoping that Livefyre’s gamble pays off since he believes that it could become the first social media conversation platform to file for an IPO, although he didn’t offer any specifics or timeframe. Is the company in a rush though? It raised $15 million just a few months ago for its Series C round of funding, bringing its total raised to nearly $20 million.